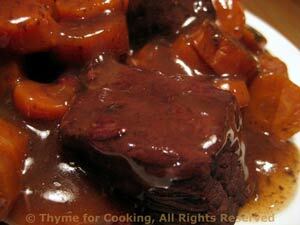 Thyme for Cooking Menus: Provençal Braised Beef and Carrots, easy recipes. This is the 'longest-cooking' of the winter braises that we will be doing. With a heavy pot and tight lid you don't need to worry about it drying out. It could be done in a slow-cooker. This is one of those long-cooking dishes that I love doing during the winter. It has a bit of bacon and sautéed carrots added, to give it its own unique flavors. The leftovers will be tossed with pasta for another dinner. Trim beef and cut into 2 inch (5 cm) cubes. Put into a deep bowl or sauce pan. Peel the onion and garlic. Cut the onion in half and stick two cloves into each half. Add to the beef along with the garlic and bouquet garni. Add the vinegar and 2 - 3 cups of red wine, enough to cover the beef. Take the meat out of the marinade and let drain, reserving all of the marinade. Peel carrots and slice into 1/4 inch (.65cm) rounds. Heat oil in large nonstick skillet over medium-high heat. 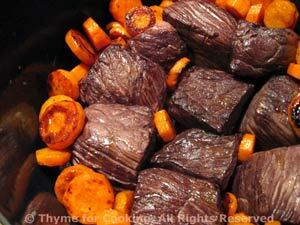 Add carrots and sauté until golden and caramelized, 10 - 12 minutes, turn once using two forks or tongs. Remove carrots and set aside. Add bacon to skillet and sauté until crisp. Remove and set aside. Add beef and brown on all sides. In a heavy baking dish (casserole), preferably deep, lay bacon on the bottom. Put the beef on top and surround the beef with the carrots. Pour the reserved marinade over all, along with the onion, garlic, bouquet garni and beef stock. Put a sheet of oiled, waxed paper over the pot and put the lid on top. Bake for 5 hours at 350F (175C). Check it every 2 hours or so to make sure it's not drying out - if it is, add more wine. Remove from oven. 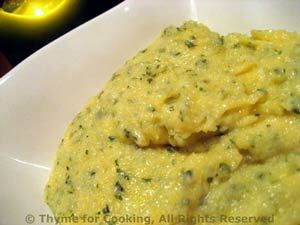 With slotted spoon take everything out of the sauce and put on a small platter. Cover with the lid or foil to keep warm. Discard bouquet garni and cloves. Bring the sauce to a boil over medium heat. Dissolve cornstarch in water. Slowly add cornstarch mixture to sauce, stirring until thickened. You probably won't need all of it so stop periodically and let it cook to test consistency. Spoon some of the sauce over the beef and carrots, serve the remainder on the side. Serve. Note: If your baking dish is not appropriate for the cook top put the red wine sauce into a small saucepan before thickening.